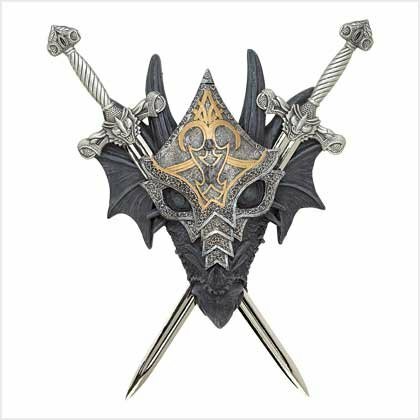 This is for a Medieval Armored Dragon Wall Crest with Pewter Swords from Shopatusm. From beneath the hood of his intricate armor, a horned dragon inspires heartfelt fear with his malicious stare. Removable swords are a chillingly accurate miniature version of the mighty weapons wielded by history's fiercest warriors. A crest fit for a king, ready to mount on the wall or door of your own castle! Polyresin with pewter swords. 8 5/8 inch x 2 inch x 9 1/2 inch high.